The Londra Hotel Florence is ideally located in the very heart of the city. It is next to the main railway station and the "Santa Maria Novella" church - one of Florence's most popular attractions. The hotel is situated close to all of Florence's major attractions and conference centers. The Hotel Balestri is a cosy modern 4 star property with a very central location (only 5 minutes walking to Ponte Vecchio and to Uffizi Gallery) and magical view onto the river. Hotel Ambasciatori is surrounded by masterpieces. It's a 6-minute walk to the Basilica of Santa Maria Novella, 10 minutes to Florence's Duomo, and 15 minutes to Galleria dellâ€™Accademia. The last named holds Michelango's "David" and Botticelliâ€™s "Madonna and Child." Set in a park with olive groves, cypress trees and valley views, this upscale hotel in a Renaissance villa also lies 9 km from the Casa Di Giotto museum. The elegant rooms and suites in the villa and an adjoining farmhouse feature antique furniture, free Wi-Fi, minibars and satellite TV. Surrounded by olive trees, this polished hotel in the Chianti Mountains is 10 km from both the Fattoria Montecchio winery and 9th-century Badia di Passignano abbey. The elegant rooms and suites, some with balconies or patios, include complimentary Wi-Fi, flat-screen TVs and minibars. This chic hotel lies a 2-minute walk from the nearest bus stop, a 7-minute walk from the 15th-century Basillica of Santa Croce and a 13-minute walk from the Uffizi museum and gallery. The minimalist, modern rooms and suites are decorated in white and gold and come with free Wi-Fi. Set in a restored 15th-century villa, this luxurious hotel is 4.5 km from Florence Cathedral and 6 km from the Uffizi gallery. The opulent, individually decorated rooms come with free Wi-Fi, flat-screen TVs and Nespresso machines. Most offer views of the Florentine skyline or the countryside. Set in the hills of Florence, this upscale hotel in an old-world villa is 6 km from Florence Cathedral and 8 km from the 16th-century Uffizi Palace. The airy rooms feature sophisticated, French-inspired decor with rustic accents, and include free Wi-Fi, flat-screen TVs and minibars. This elegant hotel, set in a 19th-century building off Piazza della LibertÃ . The airy rooms feature hardwood floors, oak furnishings and leather chairs. All provide free Wi-Fi and satellite TV. Some have balconies, and suites include living rooms. A 15-minute walk from Michelangelo's David, this cozy hotel is 1.6 km from Florence Cathedral and 2.1 km from Ponte Vecchio bridge. Featuring marble bathrooms and terracotta floors, the relaxed rooms come with free Wi-Fi, flat-screen TVs and tea and coffeemaking equipment. All 17 rooms offer free WiFi, LCD TVs, and hair dryers. Other amenities available to guests include showers, phones, and desks. Along with a restaurant, this hotel has an outdoor pool and multilingual staff. Free buffet breakfast, free WiFi in public areas, and free self parking are also provided. Set in a 19th-century villa in a residential neighborhood, this warm, elegant hotel is a 7-minute walk from Firenze Statuto train station. The straightforward rooms with simple furnishings provide free Wi-Fi, satellite TV and minibars, as well as desks. Some also feature balconies. 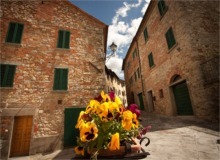 This down-to-earth hotel is 4 minutes' walk from Cionfo Binlecure railway station. Florence Cathedral, dating back to the 13th century, is 1.6 km away. Featuring warm decor, the functional rooms come with Wi-Fi (fee) and satellite TV. Some add sitting areas. Room service is available. The hotel has a complimentary breakfast buffet, plus a restaurant and a bar. The award-winning Renaissance Tuscany Il Ciocco Resort & Spa provides a piece of paradise in the heart of the Lucca countryside. 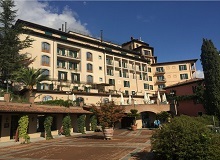 With 7 floors, 166 Rooms, and 14 suites, you'll find the hotel perched on 1,700 acres of gorgeously landscaped grounds in the Serchio Valley, one of Tuscany's most pristine areas.